The tiger is the largest of the four Big Cats in the genus Panthera. Panthera Tigris is native to much of eastern and southern Asia though its range has been diminishing steadily for many years. The largest (Siberian) tigers measure up to 3.3 metres (11 feet) in total length and weigh up to 300 kilograms (660 pounds). The most numerous tiger subspecies is the Bengal tiger. Tigers have a lifespan of ten to fifteen years in the wild, but can live longer than twenty years in captivity. They are a highly adaptable cat, and range from the Siberian coniferous forests (taiga) to the open grasslands of India and the Indonesian tropical mangrove swamps. Tigers are territorial and generally solitary animals, requiring large areas of deep dense vegetation (in which to hide and stalk, by means of its camouflaged colouring), proximity to drinking water, and of course an abundance of prey. Tigers are often found bathing in ponds, lakes, and rivers (especially in the heat of the day). Together with the jaguar, the tiger is a strong swimmer and is able to carry large prey animals through water as it swims (no doubt using its sharp teeth (which grow up to 5 inches in length) and extremely strong jaws to grip the prey carcass. Incidentally, the word “tiger” is taken from the Greek word ‘Tigris’, which is possibly derived from a Persian source meaning “arrow”, a reference to the animal’s speed (not its sharp teeth). Sadly, the tiger is an extremely endangered species, primarily due to human intervention (in deforestation and fragmentation in their habitat and also because of human hunting) but also due to the dangers of everyday existence. For example, only fifty percent of Tiger cubs survive to independence from their mother, which occurs at around two years of age. Also only 40 percent of these survivors live to establish a territory and begin to produce young. The risk of mortality continues to be high even for territorial adults, especially for males, which must defend their territories from other males. Consequently (with the human threat coupled with the everyday dangers of life) three of the nine subspecies of modern tiger have now gone extinct, and the remaining six are classified as endangered, some critically so. 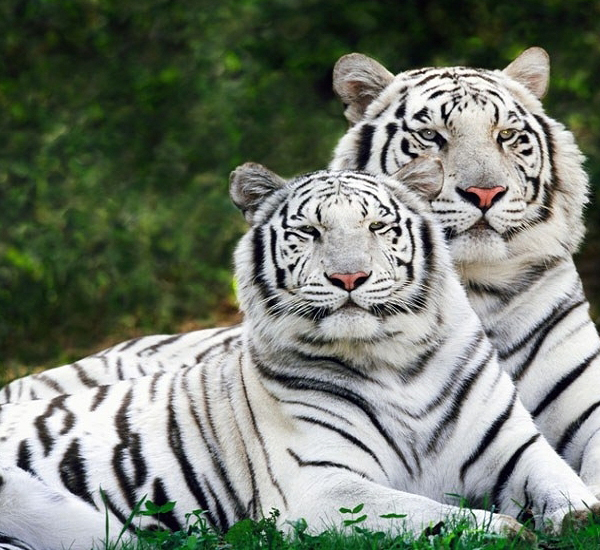 Tigers are among the most recognisable, and are in fact the most popular, of the world’s animals. They have featured prominently in ancient mythology and folklore, and continue to be depicted in modern texts and videos. Tigers appear on many flags and as mascots for sporting teams. Tigers are the national animal of several Asian nations, including India. Tigers typically have rusty-reddish to brown coats, a whitish underbelly to rear area and a white ruff that surrounds the lower jaw, neck and chin. Of course the tiger is well known for its stripes. These can vary in colour from brown or grey to pure black. The form and density of stripes differs between all the subspecies (as well as the ground coloration of the fur). The pattern of stripes is unique to each animal, these unique markings can be used by researchers to identify individuals (both in the wild and captivity).. Unusually, the stripe pattern is also found on the skin of the tiger (shown when the fur is removed). It is believed but not proven that most tigers have over one hundred stripes around the body. Like other big cats, tigers have a white spot on the backs of their ears. It is believed these spots, called ocelli provide a visual indication of the animal from the rear when it is being followed by its cubs or kittens. Tigers are thought to be nocturnal predators, but, in areas where humans are absent, they have been observed hunting during the daylight hours (using remote cameras). 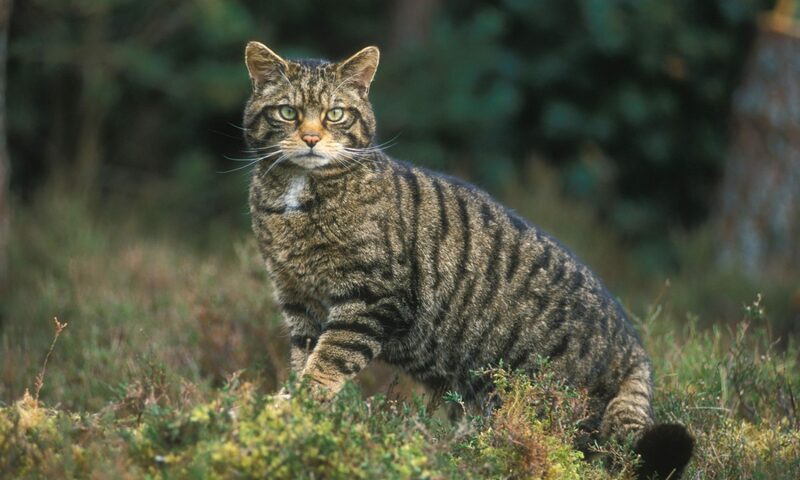 They generally hunt alone and stalk and ambush their prey as most other cats do, using their body size and strength to knock large prey off balance followng through using sharp claws and teeth and a very strong jaw! A tiger’s diet will vary depending upon the availability of prey in their region. The Bengal Tigers in India will mostly feed on larger and medium-sized animals such as sambar, wild boar, a water buffalo and domestic buffalo. 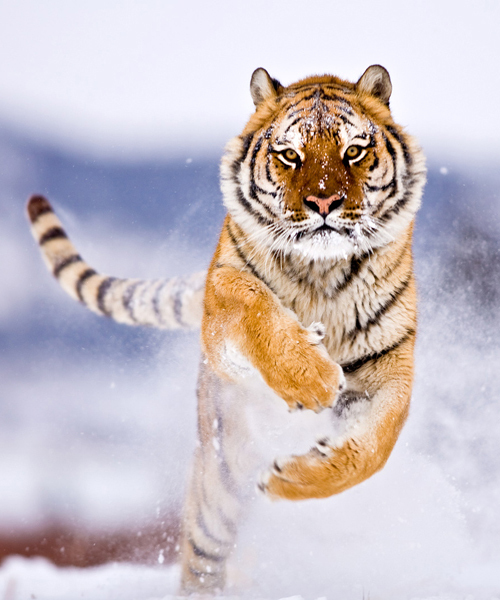 The Siberian Tiger’s main prey species include wapiti, wild boar, moose, and musk deer. The smaller species will often eat much smaller prey, such as domestic animals, monkeys, peafowls, hares, and fish. Tigers utilize a variety of vocalizations to communicate over long distances, including roaring, moaning, and chuffing. A tiger’s roar may be heard from distances of more than two miles. A tiger’s moan is more of a subdued roar and is usually made while tigers are calmly walking with their heads in a downward position. What is Known as a tiger’s chuff is a friendly vocalization used primarily for greetings and is only audible at close range. The following extract was drawn from the Wikipedia.org ‘Tiger’ Page. The Bengal Tiger Otherwise known as the Royal Bengal Tiger, Panthera tigris tigris is the most common subspecies of tiger and is found primarily in India and Bangladesh. It lives in varied habitats: grasslands, subtropical and tropical rainforests, scrub forests, wet and dry deciduous forests, and mangroves. Males in the wild usually weigh 205 to 227 kg (450 to 500 lb), while the average female will weigh about 141 kg. However, the northern Indian and the Nepalese Bengal tigers are somewhat bulkier than those found in the south of the Indian Subcontinent, with males averaging around 235 kilograms (520 lb). While conservationists already believed the population to be below 2,000, the most recent audit by the Indian Government’s National Tiger Conservation Authority has estimated the number at just 1,411 wild tigers (approximately 1165 to 1657 allowing for statistical error), a drop of 60 percent in the past decade. Since 1972, there has been a massive wildlife conservation project, known as ‘Project Tiger’, to protect the Bengal tiger. Despite increased efforts by Indian officials, poaching remains rampant and at least one Tiger Reserve (Sariska Tiger Reserve) has lost its entire tiger population to poaching. The passing of the Forest Rights Act by the Indian government in 2006 has worsened the situation as evidence has shown that human habitats and tigers cannot co-exist and has pushed the Indian tiger on the brink of extinction. However, another census by the government in 2011 using better counting methods showed a rise of 20%, taking the numbers to 1,706. Indo-Chinese Tiger The Indochinese Tiger (Panthera tigris corbetti), also called Corbett’s tiger, is found in Cambodia, China, Laos, Burma, Thailand, and Vietnam. These tigers are smaller and darker than Bengal tigers: Males weigh from 150 – 190 kg (330 – 420 lbs) while females are smaller at 110 – 140 kg (240 – 310 lbss). Their preferred habitat is forests in mountainous or hilly regions. Estimates of the Indochinese tiger population vary between 1,200 to 1,800, with only several hundred left in the wild. All existing populations are at extreme risk from poaching, prey depletion as a result of poaching of primary prey species such as deer and wild pigs, habitat fragmentation and inbreeding. In Vietnam, almost three-quarters of the tigers killed provide stock for Chinese pharmacies. Malayan Tiger The Malayan Tiger (Panthera tigris jacksoni), exclusively found in the southern part of the Malay Peninsula, was not considered a subspecies in its own right until 2004. The new classification came about after a study by Luo et al. from the Laboratory of Genomic Diversity Study, part of the National Cancer Institute of the United States. Recent counts showed there are 600 – 800 tigers in the wild, making it the third largest tiger population, behind the Bengal tiger and the Indochinese tiger. The Malayan tiger is the smallest of the mainland tiger subspecies, and the second smallest living subspecies, with males averaging about 120 kg and females about 100 kg in weight. The Malayan tiger is a national icon in Malaysia, appearing on its coat of arms and in logos of Malaysian institutions, such as Maybank. Sumatran Tiger The Sumatran Tiger (Panthera tigris sumatrae) is found only on the Indonesian island of Sumatra, and is critically endangered. It is the smallest of all living tiger subspecies, with adult males weighing between 100 – 140 kg (220 – 310 lb) and females 75 – 110 kg (170 – 240 lb). Their small size is an adaptation to the thick, dense forests of the island of Sumatra where they reside, as well as the smaller-sized prey. The wild population is estimated at between 400 and 500, seen chiefly in the island’s national parks. Recent genetic testing has revealed the presence of unique genetic markers, indicating that it may develop into a separate species,[specify] if it does not go extinct. This has led to suggestions that Sumatran tigers should have greater priority for conservation than any other subspecies. While habitat destruction is the main threat to existing tiger population (logging continues even in the supposedly protected national parks), 66 tigers were recorded as being shot and killed between 1998 and 2000, or nearly 20% of the total population. Siberian Tiger The Siberian tiger (Panthera tigris altaica), also known as the Amur, Manchurian, Altaic, Korean or North China tiger, which is the most northernmost subspecies, is confined to the Amur-Ussuri region of Primorsky Krai and Khabarovsk Krai in far eastern Siberia, where it is now protected. The largest subspecies of tiger, it has a head and body length of 160 – 180 cm for females and 190 – 230+ cm for males, plus a tail of about 60 – 110 cm long (about 270 – 330 cm in total length) and an average weight of around 227 kilograms (500 lb) for males, the Amur tiger is also noted for its thick coat, distinguished by a paler golden hue and fewer stripes. The heaviest wild Siberian tiger on record weighed in at 384 kg, but according to Mazak these giants are not confirmed via reliable references. Even so, a six-month old Siberian tiger can be as big as a fully grown leopard. The last two censuses (1996 and 2005) found 450 – 500 Amur tigers within their single, and more or less continuous, range making it one of the largest undivided tiger populations in the world. Genetic research in 2009 demonstrated that the Siberian tiger, and the western “Caspian tiger” (once thought to have been a separate subspecies that became extinct in the wild in the late 1950s) are actually the same subspecies, since the separation of the two populations may have occurred as recently as the past century due to human intervention. South China Tiger The South China Tiger (Panthera tigris amoyensis), also known as the Amoy or Xiamen tiger, is the most critically endangered subspecies of tiger and is listed as one of the 10 most endangered animals in the world. One of the smaller tiger subspecies, the length of the South China tiger ranges from 2.2 – 2.6 m (87 – 100 in) for both males and females. Males weigh between 127 and 177 kg (280 and 390 lb) while females weigh between 100 and 118 kg (220 and 260 lb). 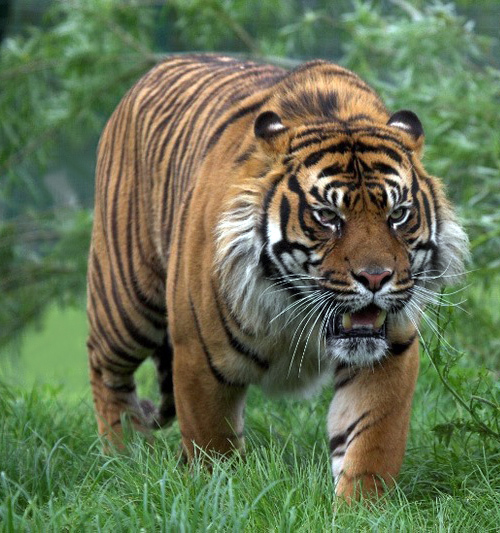 From 1983 to 2007, no South China tigers were sighted. In 2007 a farmer reported that he had spotted a tiger and handed in photographs (he had supposedly taken himself) to the authorities, as proof. The photographs in question, however, were later exposed as fake. The authorities investigated the images and found they had been copied from a Chinese calendar and digitally altered, and the sighting turned into a massive scandal. In 1977, the Chinese government passed a law banning the killing of wild tigers, but this may have been too late to save the subspecies, since it is possibly already extinct in the wild. There are currently 59 known captive South China tigers, all within China, but these are known to be descended from only six animals. Thus, the genetic diversity required to maintain the subspecies may no longer exist. Currently, there are breeding efforts to reintroduce these tigers to the wild. Source Articles: Wikipedia.org, Smithsonian National Zoo Webpages and other big cat websites.